Catherine, now divorced with grown up children Tom and Lexie, a sister Bryony a workaholic lawyer and a mother who sadly has Alzheimer’s and is in a nursing home makes the decision to move to France. 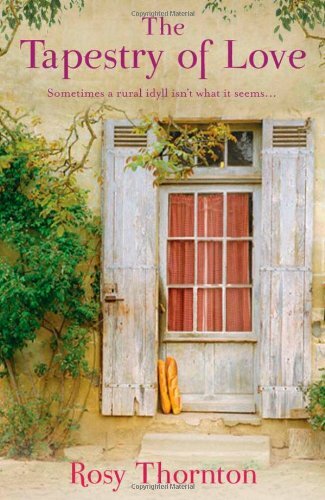 Not to a bustling city or town but a very small rural community with very few people where Catherine is exposed to the elements and the landscape which she uses for own new start. Catherine hopes to create some sort of business working with fabrics and threads and sells to the locals, in the markets, with special commissions where she can cover furniture and make curtains. Her house Les Fenils is the place to do it and whilst she settles to this work and establishes herself in the community. The community also help establish her as a local. Neighbours help where needed, inform of flooded telephone lines, drop off produce and advise on when to plant and when to harvest. As Catherine settles in to her new surroundings and the seasons, she encounters Patrick Castagnol her nearest neighbour further up the mountain than herself. A strange sort of friendship develops and goes away when her sister Bryony arrives. Bryony is suddenly on a second visit wanting to escape from the ‘rat race’ as she can see the benefit this life is having on her sister. Does Bryony have the right sort of self sufficient personality to cope with such isolation and peace? Can Catherine hold on to the idyll that she has created and not let anyone interfere? Rosy Thornton has created a wonderful book, with such a rich description of the surroundings, the seasons and weather that you actually can hear the heavy rain as it resonates all the way round the valley that Catherine is in. In stark contrast the heat has the same oppressive effect as described when Catherine adjusts her days so she is working at the coolest point outside and retreating somewhere with her tapestries when the heat becomes too much. Rosy has brought to life a landscape from the page with words but also with her descriptions of the tapestries which I can actually feel from the descriptions of colours and silks. All the characters are well rounded, with probably the exception of Bryony who has something artificial about her, although I think this adds to her character flaws and I sense a sibling rivalry between them both throughout the book which is never quite settled. The book is gently paced and has you turning the page to see what happens but also to just enjoy the experience along with Catherine in her new community. Towards the end of the book, I had a horrible feeling that Catherine was going to give up all that she had and make a change to this life which I had fallen in love with; I had to keep reading until I knew everything was going to be alright. If you pick up this book you will want to know as well. I received this book directly from the author Rosy Thornton for which I thank her but it has not influenced my review. I will be honest here as I was with Rosy that I had tried to read one of her previous novels Hearts and Minds and had given up on it. I was rather lost with it and felt it was not a book for me. I therefore picked this one up with a little bit of trepidation. Was I going to like it? And was I going to upset the author if I did not? I think hopefully you can tell from my review that I liked the book. Something about it appealed to me, in fact many things about it appealed to me. The crafts stuck out and being someone who does a lot of stitching, knitting and other craft things I could relate to what an achievement it is to see something come to life but also a dream of being able to do it for a living. When you first start out with a blank canvas and lots of colour and no pattern it is daunting (although I do love a pattern!) but soon it begins to over take you and then something appears and time has passed and you have forgotten many things that were bothering you in the first place. That for me is the joy of being creative. Reading also gives me that joy and this book also allows that passage of time and forgotten problems. I was in love with the place and could have quite happily up sticks and gone out for a few weeks to just be. Although I would have lasted less than 5 minutes because my French is somewhat non-existent. However the ideas give you that little bit of pleasure and keep dreams alive. I have certainly got the stitchy bug again since reading this book! It was on a little break I feel. I am so tempted to do some tapestry as well! What I also have the bug for is more of Rosy Thornton’s other novels and I will go back and read the one I abandoned. To learn more about Rosy Thornton see her website here or on Facebook. Lovely review of a highly enjoyable book. This does sound like a lovely book and I am reading it right now. This was a great review. I read this last year and really enjoyed it. I thought the descriptions of the Cevennes were beautiful and I wanted to go and live there too! I loved this one of my favourite reads for this year! I quite enjoyed this book mainly because of the location. I read Crossed Wires too but found it too predictable. I also had the privilege of reading this book earlier in the year. I thoroughly enjoyed it and became completely immersed in the characters and storyline. Close your eyes and you could almost imagine yourself there, although I am not sure that I would have the courage to drive on those twisty, narrow mountainous roads. I haven’t read any of Rosy Thornton’s other books, but I am tempted to give one a try. Like yourself, my French only harks back to exams taken as a youngster at school, and to be honest most of the grammar will have been long forgotten, if I actually had to put it to the test! !